Unemployed Negativity: Who are we? What do we want? 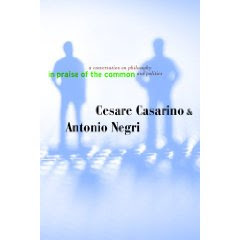 Cesare Casarino and Antonio Negri’s In Praise of the Common: A Conversation on Philosophy and Politics is truly a pleasant surprise. As an admirer of both Casarino (whose book on Melville and Marx remains unfortunately overlooked) and Negri I was excited to read the book, my excitement was tempered a bit, however, when I saw that it was primarily made up of interviews. I am not a fan of interviews, specifically philosophical interviews, which tend to produce statements of clarification, rather than real insight. As the title suggests, the work is more of a conversation, with each side exchanging ideas, than an interview. This is partly what makes it rewarding to read, but a great deal of what makes the conversation interesting depends on Casarino’s ability to press Negri on key points. I found his engagement with Negri on the tone of Empire and Multitude to be particularly interesting. Casarino engages with Negri as a “fellow-traveler” a reader of Marx and Spinoza, committed to the general orientation of his thought, but not always the specific formulations and pronouncements. In the years since the publication of Empire Negri has been more interested in pronouncements than problems, pronouncements about the nature of political power, labor, etc. Politics might need pronouncements, but philosophy requires problems. The conversations expose not just the problems underlying the pronouncements, but the problematics, the orientation of thought. In Casarino’s writing, and in the discussions that follow, the “common” becomes a manner of reframing and focusing the dualities that traverse both Negri’s work, dualities that hover around the central division between potential and actual, between the multitude in-itself and for-itself. What interests me about the common, however, is that it shifts the focus of Negri’s work (as well as other post-autonomists such as Virno) from the who, the constitution of the multitude as a kind of subjectivity, to the what, to the structures and institutions (borrowing Stiegler’s terms). Or rather, it stresses that there is no who without a what, no constitution of subjectivity without material structures and institutions. I think this focus makes it possible to think what I have often referred to as the paradox of contemporary capitalism: never have human beings been more social in their existence, but more individualized, privatized, in the apprehension of their existence. On the one hand, the simplest action from making a meal to writing an essay engages the labor of individuals around the world, materialized in commodities, habits, and machines, while on the other, everything, every social relation can be purchased as a commodity. This paradox is not just the conflict between two different productions of subjectivity, the emergent multitude, collective to the core, and the neoliberal subject, locked in a competitive struggle that defines its very existence. It is also a conflict between different structures and materializations of subjectivity, between the commodity, which privatizes desire, and the commons, inseparable from collectivity (incidentally Casarino has interesting remarks about the former). As Nick Dyer-Witherfood argues, if the elementary unit of capitalism is the commodity then the elementary unit of communism is the commons. Thus, as something of a conclusion, the politics of the future must produce both the multitude and the commons, subjectivity and its material conditions.